My husband loves southern veggies. He could eat a veggie plate every night for dinner and be happy. 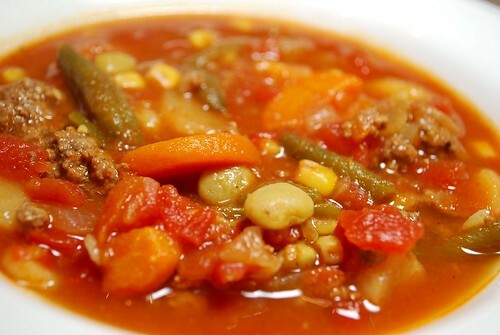 One of my favorite veggie dishes that he makes for us is his Beefy Veggie Soup. It tastes so amazing that you would never believe how easy it is to make. We always have it with some nice hot cornbread on the side. Yummmmmm…. Heat a heavy skillet over medium heat. Add ground beef, onion, garlic, and salt and pepper to taste. 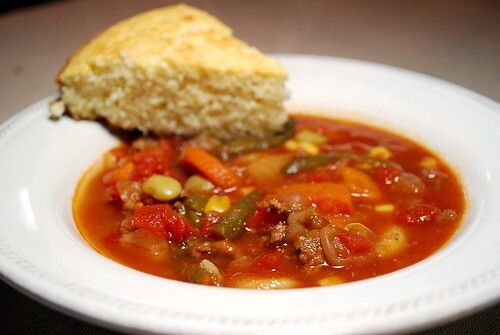 Cook through, drain, and pour into a large pot or crock pot. Dump the rest of the ingredients in. Note that you should not drain the canned veggies – pour them in, juice and all. Stir ingredients together. If you’re using a pot, then simmer for 1 hour. If you’re using your crock pot, cook on low for 6-8 hours or high 2-4 hours. 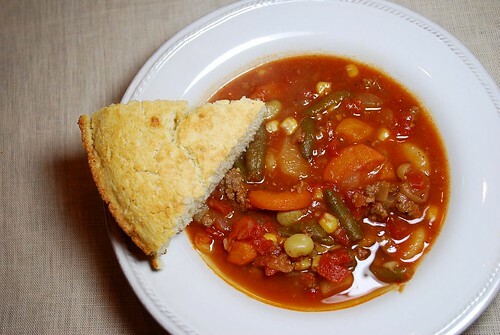 Serve with Southern Boy’s Cornbread.